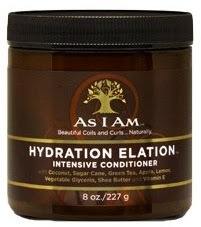 After asking you guys on Facebook and Twitter, whether you prefer written product reviews or watching them on youtube, the results were pretty balanced, so Im gona try and cater to both, so this is the first attempt so far: As I Am's Hydration Elation - Intensive Conditioner. I've been pretty much desperate to find a really good Deep Conditioner but at the time of trying this product (approximately 2 weeks ago) I wasn't approaching anything with much optimism. This was due to the growing amount of evidence that I may have Lo-Po hair i.e Low Porosity hair. This means it's a struggle for water/ moisture to get in or out of my hair because the cuticles are so tight. Some how this product charmed its way passed my cuticles and worked brilliantly. I was really surprised at how soft and well moisturised my hair felt after using the Hydration Elation. I think it was exactly what my hair needed. It reminded me of the results I used to get with Kera Care Humecto Creme Conditioner, in fact, it may have knocked it off the top spot, but I'll have use it a couple more times to be sure. I would say the only downside to this product is the price - at £16.75 its more than I usually like to pay for a product - BUT - when I consider how great it worked for me as well as the fact that I used loads (because it takes a lot to condition my hair) and still have loads left, I would definitely buy this product again. This is mainly because, I know it wont run out quickly (unlike the Kera Care) so it doubles up as both a luxury AND an investment for my hair. Personally I love the smell and the texture, although I couldn't work out what the smell was exactly. It had a sweet yet nutty smell, and the texture was like a body cream, not as thick as a butter but not as light as a lotion. I think this was perfect for me as it wasn't too thick to penetrate my hair, but neither was it too light to notice. Just perfect for me. The instructions suggest using the hydration elation once every 2-3 weeks but I don't know if I'll wait that long. I was really impressed with the results so I'm planning to treat myself to some of the other products by As I Am soon. seems like a nice products. checked the website and yes it is pricey. and the shipping is expensive as well.